Hiring a wedding suit is very common as the groom will often be dressed the same as his best man and ushers, and buying all the suits would be very expensive. Here are some top tips on hiring the perfect wedding suit. If you or your fiancé have specific ideas about what sort of outfit you’d like him to wear on the big day, talk over these with the hire shop and see what they can do. If he’s not happy with the outfits on offer, look elsewhere until you find a hire company that caters for his style. Just because you are hiring suits they don’t need to be dull or old fashioned. Check whether the hire shop can provide accessories such as shirts, ties or cravats, cummerbunds, and even shoes. Ask whether it is possible for the groom to have distinct accessories to distinguish him from the rest of the male entourage. For example, if the group are sporting green ties and cream waistcoats, the groom could wear a green waistcoat and a cream tie. Perhaps you can get a discount on these items if you are hiring a number of outfits for the wedding party. Find a reliable menswear supplier that has a modern range of suits, takes individual measurements, and offers an initial fitting as well as a final fitting when the garments are picked up. Offer some input into your fiancé’s outfit if possible. Collect catalogues from a few hire shops with the idea of checking out costs, and then show him a few that you think would blend in with your particular wedding style. While it is more usual these days for men to take an interest in fashion, many are still clueless about what is appropriate to wear to a particular occasion. 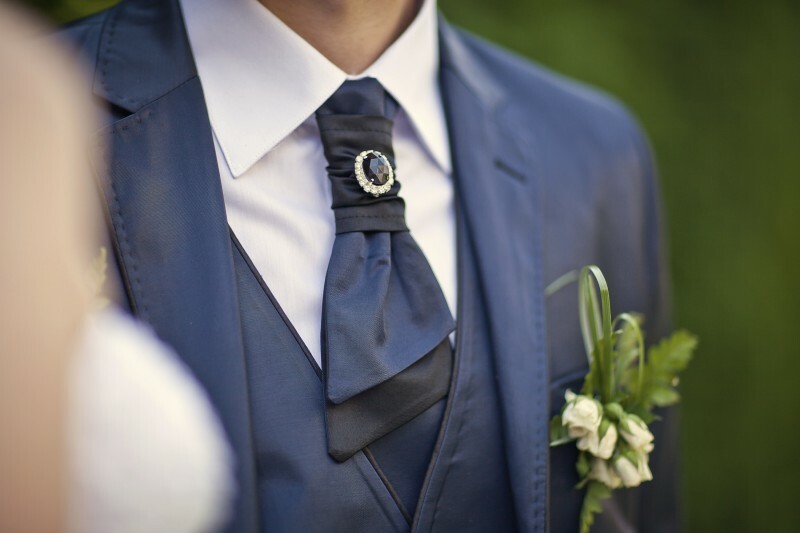 Men vary in weight just as much as women in the run up to a wedding, so don’t have the fitting too far in advance. Book the suits and organise an initial fitting about three months before the wedding. Arrange for the final fitting, and for the suits to be picked up, a few days before the big day. This allows time for last minute alterations if all the beer from the stag night has made him put on a few extra pounds. Try to hire all the suits from the same outlet to ensure that they are exactly the same colour and fabric. If your fiancé’s best man lives too far away and you are using a national supplier, it is better to have him go into his nearest store to get measured and have the measurements sent to your local store, instead of him collecting the suit locally. When do the suits need to be returned and are there added costs for alterations or cleaning? How much is the deposit and how and when will it be returned? Choose one of the male members of the bridal party and make them responsible for collecting up the suits and sending them back, especially if you are departing for your honeymoon straight after the wedding. When the groom goes for his suit fitting, get him to move around in the suit to see how comfortable it is. The suit may feel fine when he’s standing stock still, but it might well be a very different story when he’s twirling you around the dance floor during your well-rehearsed foxtrot. If there’s a fitting room on the shop premises he can do his own personal little dance just to make sure he has enough room to move.